Will The Real Matt Murray Please Stand Up? - The Point Data-driven hockey storytelling that gets right to the point. Will The Real Matt Murray Please Stand Up? It has been a roller coaster season for Matt Murray. He got off to a decent start, winning four of his first five starts, but it went so bad, so quickly. 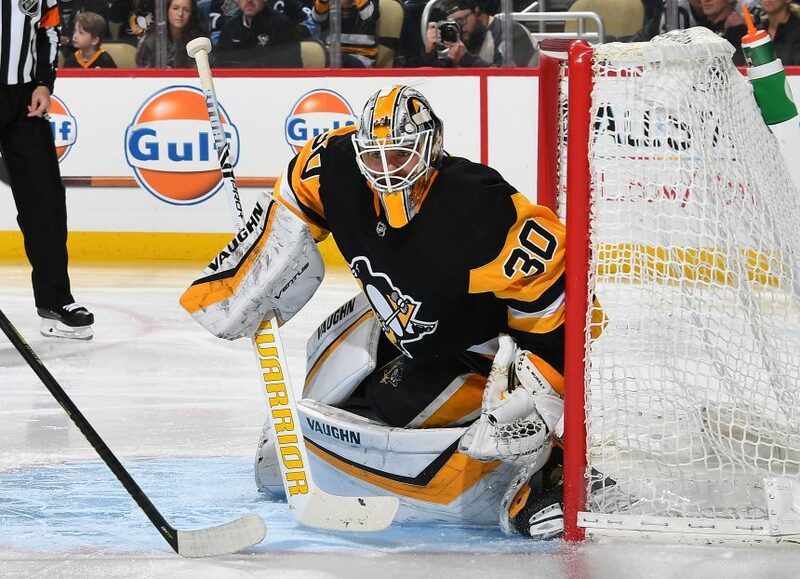 Murray lost his next six starts, was pulled multiple times and posted a nausea-inducing .829 save percentage for a Pittsburgh team that struggled to get going. The roller coaster reached its lowest point when Murray was placed on IR in the middle of November. The recovery would last about a month. Since he returned from injury, it’s been the Matt Murray Show. He’s won eight straight starts, allowing over two goals only once and recording a pair of shutouts. The team has had a great revival in the standings, going from 21st on December 14 to 10th today, two points off the division lead. So, what happened? Murray has gone berserk in just about every category. He went from costing his team an average of a nearly a goal per game to saving nearly two goals per game despite facing a massive increase in shots against. His inner slot save percentage is up by nearly 30%! 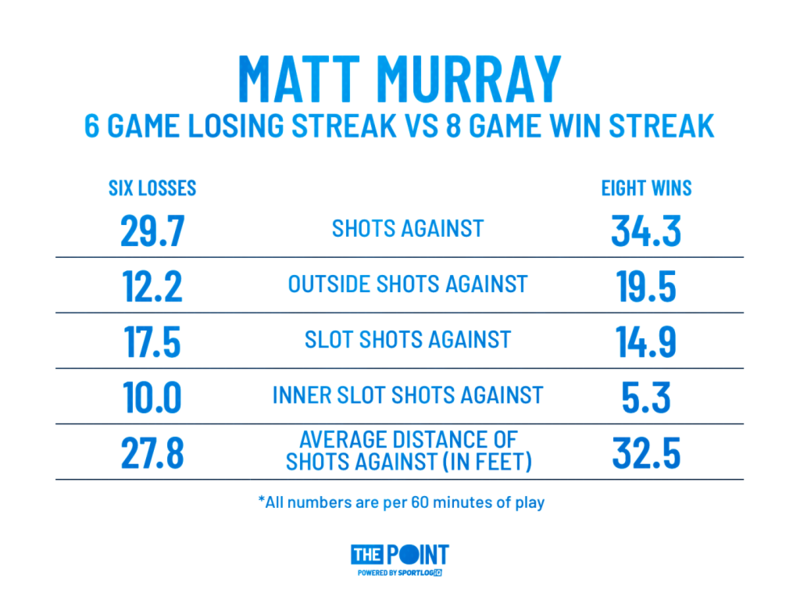 Murray was pulled multiple times in the losing streak, however, so per-game numbers are skewed since they don’t make the difference between a 20-minute appearance or a full 60 minutes game. Let’s turn to per-60 numbers instead, to normalize the numbers. This paints a better picture of what is actually going on. The shot total is still significantly up, but the amount of quality shots he faces has plummeted, particularly from the most high-danger area, the inner slot. The average shot distance has also gone up, showing he faces more and more outside shots, which are usually easier to stop. This lines up with something we’ve heard from different goalies over the years. Many goalies have said they prefer to face more shots on a nightly basis to keep them focused and in the game. A low shot total can take your mind off the game after long stretches without action. And when most of these shots are coming from distance, it’s easier to make some easy saves to get the rhythm and confidence going. Couple that with significantly less point-blank attempts and you get performances like Matt Murray’s over his last eight starts. 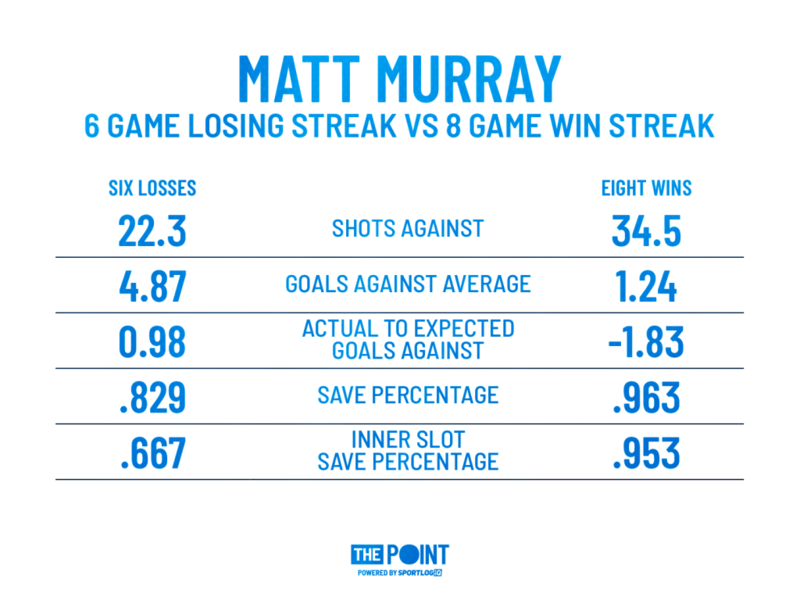 Murray has been near flawless from the inner slot, giving up only a pair of goals on 43 shots since he returned from injury. Now, his .953 save percentage from the inner slot is higher than the season leader in total save % (.930 by Jack Campbell, kudos to him by the way), so it’s obviously going to go down in the coming weeks. However, if these kinds of performances are the real Matt Murray, Pittsburgh will be hard to stop in the playoffs. Looks like our Christmas gift to them has reached its destination after all.